backward flexion or bending, as of the hand or foot. 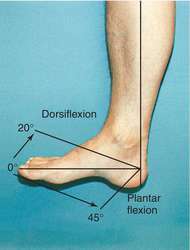 Dorsiflexion. From Lammon et al., 1995. Upward movement (extension) of the foot or toes or of the hand or fingers. /dor·si·flex·ion/ (dor″sĭ-flek´shun) flexion or bending toward the extensor aspect of a limb, as of the hand or foot. upward or backward flexion of a part of the body. See also dorsiflexor. dorsiflex, v.
Turning upward of the foot or toes or of the hand or fingers. A bending backwards of any part. movement at the ankle joint that points the foot up towards the leg, or movement of the toes that lifts them away from the sole of the foot (compare plantarflexion). backward flexion or bending, as of the neck. The aim of this study was to examine the acute effects of stretching MG of the non-dominant limb on muscle stiffness and hardness, dorsiflexion angle and isometric muscle power, after SS with the ankle, CS at a repeated constant velocity of 10[degrees]/s, or no stretching intervention (control) for 2 minutes. Adicionalmente, se puede realizar la maniobra denomina "prueba del molinete" o " windlass test", que consiste en realizar una dorsiflexion del primer dedo del pie: si resulta positiva el dolor incrementara. Currently the bubble inclinometer used in this study did not have the ability to establish the vertical gravity -0- position (7) in order to determine the absolute values for dorsiflexion and plantar flexion separately. Consecuencias patologicas de la limitacion en la dorsiflexion de tobillo. Another finding in this study was the relationship between decreased left ankle plantarflexion and acute or recurrent LAS, while no relationship was found between dorsiflexion of ankle as well as the first metatarsophalangeal joint and LAS. The weakness of dorsiflexion of ankle joint was still noted, and the report of nerve conduction velocity electromyography revealed common peroneal nerve neuropathy with active denervation. This is attributed to the dorsiflexion of the foot; a postoperative effect of tibialis posterior transfer. Female Soldiers possess less ankle dorsiflexion, inversion, and eversion strength than male Soldiers. Positive angles are dorsiflexion, inversion, and internal rotation for dorsiflexion-plantar flexion (DP), inversion-eversion (IE), and external-internal rotation (EI), respectively. The ankle was plantar flexed at toe strike, reached maximal dorsiflexion at 50% of stan flexed at toe off in the barefoot condition. Despite this, the intervention group showed a trend towards improvement for all positions except for those in dorsiflexion (FD5 and FD10). When walking on heels, left foot dorsiflexion was impaired.